Competitive advantage isn’t simply a matter of working out your differences, and the attributes that set you apart, but what you do with that information. How do you turn your differences into a marketing campaign, how do you build messages based around that information? Strategic marketing is key to building a coherent marketing program based around core principles. When we work with clients to discover their competitive advantage, we show them the wheel below. 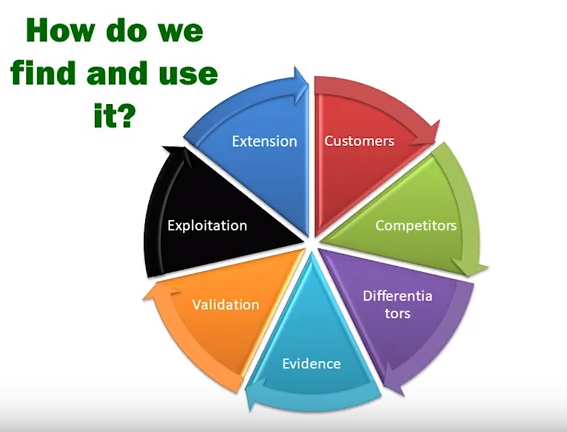 On the wheel are 7 segments: customers, competitors, differentiation, evidence, validation, exploitation and extension. We work out why your customers like you, why are they staying with you. We look at your competitors, both direct and indirect. We look at what sets you apart from your rivals. We speak to customers for you to gain real feedback about why your customers like you. We can then produce in-depth case studies which show what sets you apart. Now we understand what makes you different, we can build messages that show this, so that your customers are receiving the correct messaging in their marketing. Then we can look forward to the future, and see whether you will be able to retain your competitive advantage or if it is something that your competitors will be able to replicate. When investors look at a company, this is one of the key indicators that they use, will you be able to retain your competitive advantage or not? If you are struggling with your marketing, unsure about your messaging, or simply running out of time, take a look at our marketing manager package. To learn more about competitive advantage, please click below to watch the video. This entry was posted in Webinars and tagged competitive advantage, Content marketing. marketing strategy on 23rd May 2018 by Lizzie Hopkinson.